anti-bacteria on the facial skin. Reduces the inflammation of acne and blemish on the face skin. 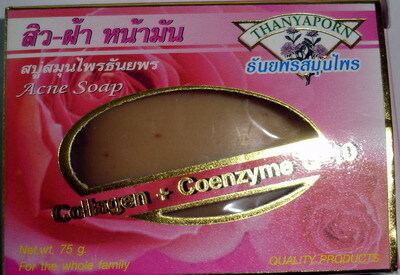 Natural Herbal Products from Thanyaporn Herbs Thailand: Acne Soap bar Herbal Acne Soap: Anti-bacteria on the facial skin. Reduces the inflammation of acne and blemish on the face skin. Acne Soap contains Cereal, herbal extract, Collagen, Coenzyme Q-10, Sodium Palm Kernelate, Sodium Palmate, Glycering, Tricolosan.